I’m on summer vacation. No, I’m not taking any beach trips, darn it. I enjoyed a fun birthday/writing retreat in Nashville at the beginning of July, and spent the weekend of the 16th in Cincinnati with my parents for their 57th anniversary, instead of going to Thrillerfest. Mostly my vacation means I’m making only occasional excursions to social media, and I’ve given my daily blog a rest. Okay, the rest is really for me, not the blog. Oh, and I’ve been writing a novel. For years I’ve wanted to write a cozy mystery. My existing novels are so far from being cozies that when I tell people of this desire, they give me looks that range from alarm to puzzlement. But for me, it’s just a matter of wanting to try something new. The novel I’m publishing with Mulholland Books next year, ONE LAST SECRET, is straight suspense, without any supernatural elements–and that is new for me. The cozy I’m working on is simply me trying another new thing. Have you ever done a modeling writing exercise? I had a workshop teacher who often gave us exercises in which we would try to write in the style/voice of a famous writer: Flannery O’Connor, Dashiell Hammett, Hemingway. Hemingway was my favorite. We wrote as less distinctive writers, too. It’s an excellent exercise for emerging writers because it’s rather like walking in the shoes of the greats. Those shoes never fit, of course, but it’s as fun as being a four-year-old in Mom’s high heels. It’s useful, too. Developing one’s singular writing style takes a long time, and the exercise puts you immediately into the head of an established voice. While I’m not particularly mystical, I have a strong belief in Things Happening For A Reason. So when my good writer friend, Carolyn Haines–who has written around 850,000 books and stories in the past few decades–said she was in search of writers to be a part of her new black cat detective mystery series, Familiar Legacy, featuring Trouble, the black cat detective, I said I’m in! before I’d even heard the details. I mean, why not? 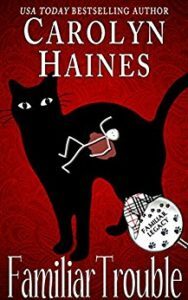 I’d never written a black cat detective mystery, but I sure wanted to try. The Trouble books have a familiar formula that includes girl meets boy, and a mystery-loving critter. 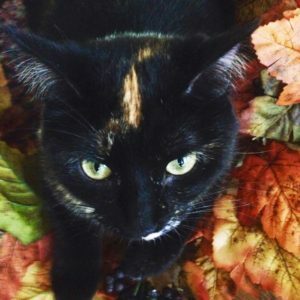 Trouble the cat is the son of cat-hero detective, Familiar, who was the star of of Carolyn’s long-running Harlequin Intrigue book series, Fear Familiar. She rereleased many of the Fear Familiar books this spring, and launched her first Trouble novel, Familiar Trouble, on July 10th. 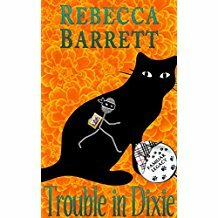 The second in the new series, Trouble in Dixie by Rebecca Barrett, comes out in August. My first job was to come up with a synopsis, and a title. The synopsis blossomed into a detailed outline. For me, it was a very detailed outline. I usually write skeletal outlines for my own books, but I rarely know how the book will end before I start writing. Then there’s that messy middle bit. For Small Town Trouble I pretty much know every turn, from beginning to end. There have been a few changes as I write, but nothing too substantive. And they’ve enhanced and deepened the story. I’ve mentioned before that I used to imagine complete stories, but then told myself that since I knew the ending it would be boring to write it out. With this book, I’ve found the complete opposite is true. It’s a huge challenge for me to follow a story I’ve put together ahead of time–but it’s also a huge amount of fun. When I sit down to write, it’s a relief to take out my outline and note which scene I’m going to write, because I’ve already done the hardest part. It relieves me of those fearful blank moments, the ones in which I’m not sure what I’m about to write–if I can write anything–is going to move the story along. The other big challenge is to keep the voice of Trouble consistent. The good news is that Carolyn is such a pro that the voice is clear and vibrant throughout her book, so I have an excellent model. That’s where my love of the modeling exercise comes in–it’s enjoyable to have the voice ready-made for me. I simply keep Familiar Trouble open on my desktop for reference. Carolyn has read my first chapter, and approved the voice, so I’m headed in the right direction. I’m only halfway through the writing, so let’s hope it sticks. I’m loving this new challenge. I feel like I’m growing as a writer. Learning to write in a different style grows bran cells. I’m sure of it! I’m anxious to finish writing Small Town Trouble to see how my first cozy experiment has gone. I could write more here about how writing this book is different from others I’ve written, but I’ll save that for another day, perhaps on my own blog, Notes From the Handbasket (you can go there even though I’m on sabbatical–I think I have 8 years’ worth of posts). Do tell. What new projects have you taken on to encourage yourself to grow as a writer?